Sometimes I feel like we Africans have lost our sense of identity, we don’t know who we are anymore and much of the blame is put on the indomitable force called Globalization which has lead to the infiltration of western culture. I once attended a workshop my firm organized for some local Community based organizations and there was a heated debate when one participant remarked that we ladies present were Euro-Africans. I was really upset by that comment and nearly told him to tell his wife that she was Euro-African. But after a while ,I think I agreed with him to an extent because these days we have a lot of Brazilian-Ghanaians, Peruvian-Ghanaians and so on and forth. You know what I mean right (the Brazilian Hair craze that hit Ghana recently- but that’s another story). Everyday I ask this question. Can I confidently say I am the symbol of my unique African culture? Or do I merely rely on my dark skin and Afro hair to portray my identity? I don’t even know what it meant to be Ghanaian anymore. I see little kids speak fluent English ,but when asked simple questions in the local dialet , really struggle with the answers. I don’t think they even understand any of it at all. I myself am a victim and I can’t make a statement in my local language without incorporating English words into my sentences. On my recent trip abroad, I was constantly asked by my colleagues what our official language was and we surprised when I said it was English.Hmm!!! Sadly,this year I wasn't around for the celebration but when I came back home we had our own small celebration where we made the special food called ''kpokpoi". As a Ga, every year in August we celebrate Homowo. 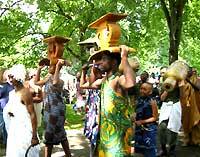 Homowo literally means "Hooting at hunger".It is celebrated to remind my people of their victory over a great famine which they experienced in the Olden days when they were migrating from their ancestral homeland to occupy their present area of settlement, Accra. As the famine came to an end and they had a good harvest, they hooted at the hunger for which they had suffered. 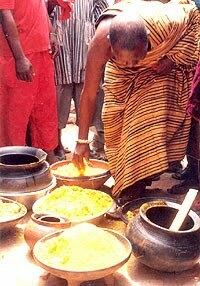 Hence/the name "Homowo" which means hooting at hunger.There is also another version. It claims that the festival was delivered from the Jewish Passover. It attributs the unleavened com bread to that of Jewish unleavened flour bread as the ritual food, the red clay painted at the door posts and the way the people eat in hurry during the festival are similar to the traditions of the Jewish Passover feast. Before the festival, a ban is placed on drumming, dancing, merry-making and any other form of noise making in the Ga-Adangme traditional area. The ban starts with the "nmaadumo" and lasts for thirty days. 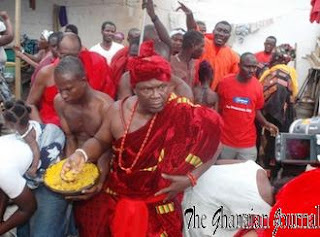 Special rites are performed by the priest and the Gbese Mantse to mark the end of the ban. This has caused a lot of commotion between the Christian community and the Ga Traditional authorities as some churches do not understand why they should obey the dictates of the traditionalists. Even, traditional prayers have been cut out of our independence day parade activities. Not everyone celebrate in this great festival because some claim it means participating in traditional religion which revers lesser gods. Christmas comes naturally to them with Christmas decorations and mistletoes and stuff. As for me, I cannot look to something that I cannot claim to be my own, some foreign saint that I cannot relate to. My Jesus has an Afro, because he created me in his own image and he led my ancestors all the way from their ancestral home and provided them with food and I will remember this every year of my life and give thanks. Never forget who you are or where you come from !! !